Ziring follows through on his concept. Each map represents its particular element, if not fantastically so. You'll see buildings floating in air, swim with the fishies, go spelunking and dance through the flames of purgation. You'll also encounter a divide between the techbase sections that represent Earth's garrisons and the actual plane within which they are based. Eschewing automaps, Ziring has included directory maps located within the four main levels, which provide accurate mementos of each layout. He's also utilized a variety of special effects, detailed within ELNOTES.TXT. Most of these tricks should be very well-known to authors nowadays, excepting perhaps the reject table manipulation. Difficulty is actually a bit upscale for an E1 replacement. 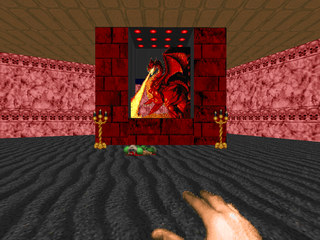 Ziring uses the full Doom palette, sometimes with brutal results, but that's mostly due to keeping a tight rein on ammo combined with a few dastardly scenarios. I kind of miss the SSG when handling the Barons and whatnot, but you usually have a plasma rifle or rocket launcher to keep you company, so no worries. Pistol starters will definitely feel the pinch, though the maps are definitely doable. I should also mention that Ziring has included animals enshrined in each map that represent the elements. It shows he has a sense of humor. I mean, the first one is the dodo, of all things, followed by a skate for the realm of water. Would I recommend Elements? Well, do you hate '94 maps? If so, avoid. 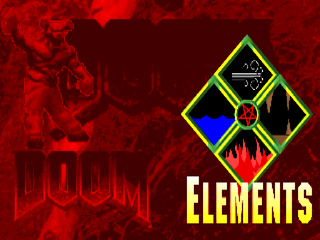 Elements isn't awful but it's hardly the classiest WAD from that era, despite its classical soundtrack (which gives the WAD a very chill atmosphere). 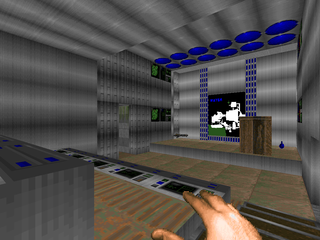 I, however, can't help but smile at Ziring's manufactured world, and if you enjoy the unabashed enthusiasm for Doom contained in such offerings, then I heartily suggest you give this mapset a try. 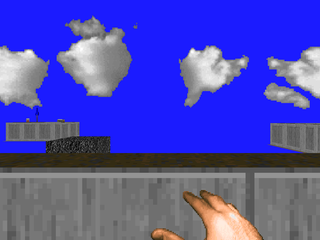 "Air" is basically a small techbase level with some primitive special effects to drive the point home. Ziring takes advantage of the airy, cloudy sky and has several enemies standing on crystal sector platforms as well as a teleporter segment that takes place on platforms suspended in what is ostensibly midair. 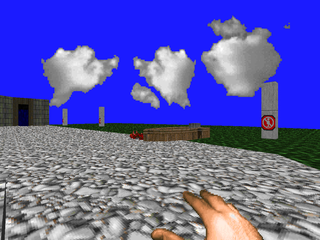 Combat is run of the mill, though some of the open air segments can be a little challenging, with some roaming fliers. The biggest stumbling block is the hidden chaingun. Other fun bits: the dodo, the soul sphere, and the exit leading to the realm of water. More techbase with a recurring water theme, of course. The primary motif is running water, either running under your feet or pouring from a hole in some higher location. 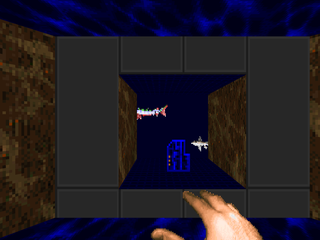 Ziring has two cool features here, a primitive underwater section where you can see fish swimming on by, and a beach that's been closed, probably due to demonic pollution. Fighting is a little tougher with more higher-health mobs like cacodemons and barons bustling around, but your armaments are basically adequate, as long as you use the secrets and environment to your advantage. "Earth", appropriately, involves progressing through a series of caverns, eventually bumping up against the domain of Fire, surrounded by lava. Among the better moments are a switch-based column puzzle (actually pretty clever) and the vast underground chambers you do all your fighting in. I particularly like the rocket launcher chamber and the use of rad suits as well as the somewhat dangerous lift / walkway feature in the penultimate room, where you have to watch out for a variety of obstacles. Pretty neat. Also some minor techbase stuff, including an overturned chair. Ehhh, it's a decent secret map. 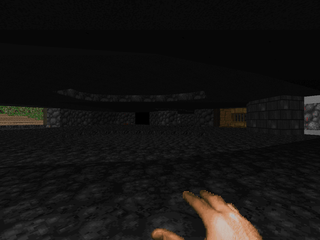 Ziring uses the crystal stair sector effect to give the map an uncanny, supernatural feeling, but beyond some marble and token skull textures, it's pretty middling. There's a mandatory BFG secret, without which you'll be hard-pressed to take on the map's dual Spiderdemons, though you might be able to get the crowd of Barons at the exit to do the job for you. "Fire" contains, well, fire, among other things, including some garish pink marble. "Fire" is perhaps the hardest map of the set, due to both encounters and a critical ammo shortage. 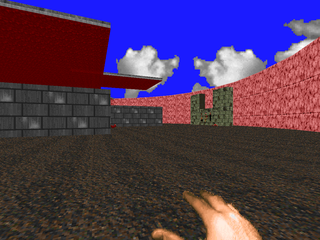 Several of the map's areas are one-shot affairs. You'll miss the second plasma rifle if you aren't fast enough and you'll miss a whole segment if you press a switch in the central chamber too soon. Though such instances are regrettable, it's still a fun play, with nasty traps like the huge horde of demons that boil out of the rocket launcher secret. There's a Cyberdemon fight for a finale but explorers have a way of neutering him entirely. This was the first PWAD I ever played, many years ago. I think its a classic.